Carrom or carroms is a family of tabletop games sharing a similarity in that their mechanics lie somewhere between billiards and table shuffleboard. The game has various other names around the world, including carrum, couronne, carum, karam, karom, karum, and finger billiards. The origins of carrom are uncertain, although western sources suggest that the game is of Indian, Portugese, or Burmese origin. Variations of the game played with a cue stick similar to those used in billiards-type games may have independently developed in several cases as a mixture of billiards and shuffleboard. The game is very popular in India, and in Punjabi it is called fatta. Similar games are played throughout the world, and may or may not share common origins with carrom. In Denmark a similar game called bob is played with cues rather than fingers. There is a carrom-like game also played with cues in China. 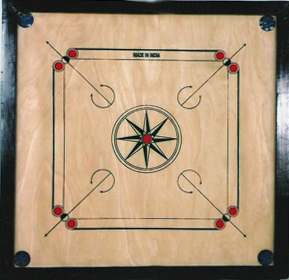 A carrom-man is a usually wooden uniform small disk used in playing carrom. The Carrom-men have a smooth movement in a flat position on the surface of the carrom board when hit by a striker of standard specification. The carrom-men come in two colors denoting the two players . Traditionally, these colors are white and black. The breaker always plays white. An additional, special carrom-man is colored red and called the "queen". ICF-sanctioned pieces must have a diameter of no more than 3.18 cm and no less than 3.02 cm, and must be between 7 mm and 9 mm thick, with an edge that is round and plain, and a weight of 5–5.5 g.
The red queen or "match-taker" coin/seed, is the most powerful carrom piece. It is placed at the center of the circle. Under ICF rules, if a player wins the board with the queen, this adds three 3 "queen points" to the player's total score. A player has the right to pocket the queen and to cover it provided a carrom-man of the player's own has already been pocketed. Under ICF rules, the dimensions of the queen must be the same as those of the other carrom-men. According to the ICF, the world carrom champion recognized in 2003 is Indian striker Wasif Osmani. He has been Indian defending champion 6 years running. The national competition consists of over 10 million competitors. The striker is a larger, heavier piece, flicked with the finger to hit the carrom-men and knock them into the corner pockets or into each other. According to the laws by ICF, the striker "shall be smooth and round, with a diameter not more than 4.13 cm.". Its weight should not be more than 15 grams. vory and metal strikers are not allowed in tournaments. High quality powder is used on the board to enable the pieces to slide easily. Boric acid powder is the most commonly used for this purpose. In the UK, many players use a version of anti-set-off spray powder from the printing industry which has specific electrostatic properties with particles of 50 micrometres in diameter. The powder is made from pure, food-grade vegetable starch. International rules are promulgated by the India-based International Carrom Federation, the governing body of carrom. The organisation also ranks players, sanctions tournaments and presents awards, and has many national affiliates such as the All-India Carrom Federation, Australian Carrom Federation, UK Carrom Association and US Carrom Association.There is a penalty a person has to pay if his striker goes in the hole.This term is referred to as deuce. The penalty is usually 10.